In retrospect the whole process of actually getting to experience Alejandro G. Iñárritu’s situated VR installation CARNE Y ARENA at the Fondazione Prada in Milano now looks like a privileged white man’s version of what the protagonists of the installation have gone trough: The almost overwhelming uncertainty if i would ever manage to get there (the result of overwhelmed web servers that could not keep up with the demand for the microscopic amount of tickets available), the realisation that a group only travels as fast as it’s weakest members (an object lesson taught by a group of Filipino women who boarded the flight to Milano with way too much carry on luggage causing the worst boarding mess that i ever experienced) and the ability of those whom you have entrusted with your fate to extract extra compensation (the taxi diver who needed to be bribed into accepting payment by credit card). 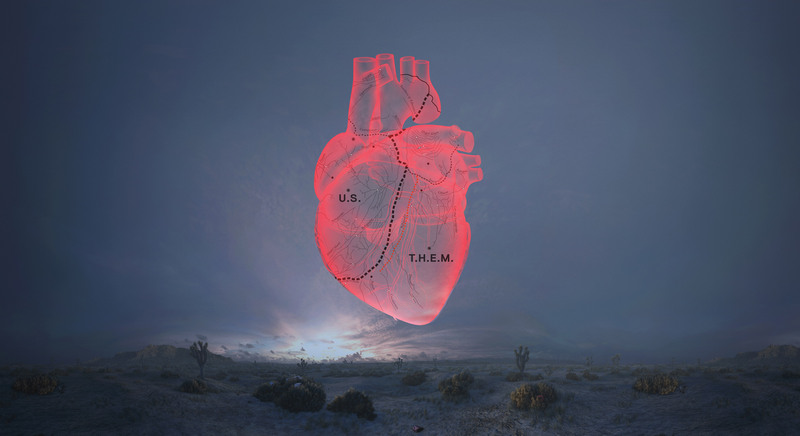 While CARNE Y ARENA is primarily described as a possibly genre-defining Virtual Reality experience, the actual VR element (as in the 3D environment projected through the headset) is probably the least interesting bit of it, even though the cinematography is stunning and the choreography of the actions unfolding around you is equally master-full. Rather it is the use of the supporting sensory triggers that both makes and breaks the illusion created by the VR headset (the whole experience was probably helped by the fact that as a result of my hurried attempts to get there in time i was thirsty for the duration of the experience): The coldness in the holding cell crates a feeling of being out of control that primes you for the desert scene. The cold, rough desert sand and the unidentifiable scent immediately situate you in the desert. As long as you are “alone” in the desert (and later during the helicopter overpasses) the wind machines complete the illusion created by the VR headset. Once the exhausted migrants appear the illusion starts getting strained. For me this had little to do with the the fact that they were clearly identifiable as rendered characters (as the Verge complains), or even the fact that you could walk into the characters (according the NYT review this seems to be a feature that i did not recognise as such) but rather the fact that i was unable to physically relate to them within the parameters of the simulation. As the group came under attack by the border patrol my urge was to get closer to the other protagonists and to somehow protect or comfort them. But my attempt to hold on to the foot of a frightened child broke the simulation as there was noting to touch and no-one i could comfort. In the end the very limitations of the simulation amplify the message. Regardless how much i wanted to identify with the the harassed group of migrants, and as much as i experienced the sensory overload of being alone in the dark desert at the mercy of armed men, the limitations of the technology reminded me of my real status as a distant observer. That divergence between your desire to relate, fuelled by the state of the art manipulation of your senses and your inability to completely escape your situated-ness in the real world creates (or at least it created for me) a very profound understanding what it means to be the other (in this case one of the migrants). Contrary to what i had expected it is not the technical perfection of the installation that constitutes the empathy machine, but the fact that you are reminded that you are indeed only “virtually present” that delivers the message. As confronting as the last scene, where the simulation finally acknowledges your presence and the border patrol officer approaches you shouting and with his assault rifle aimed at you, may be, it was the fact that i could simply leave that brought home the point that for the migrants this option does not exist. Still, leaving the desert scene left me shell shocked and i spend a long time watching the video testimonials of the migrant protagonists in the decompression room that constitutes the last part of the experience. It is impossible to tell if these were so captivating because of the state i was in or because of the fact that i was alone with them or because of the accomplished videography and performance or because of all of these aspects combined. In the end the most interesting question is how this way of story telling can ever scale in any meaningful way. The way it is set up in Milano (individual 15 minute slots) the total capacity is somewhere around 5000 visitors in half a year. There are currently 3 instances of CARNE Y ARENA (the other ones are im Mexico City and in Los Angeles) which seems utterly insufficient to reach anyone beyond a very determined part of the global cultural elites, who are likely the ones who are least challenged in their belief systems by the urgent social message encoded in this technological masterpiece. It is not me who needed the exposure to the desperate realities of migrants fighting for their dignity under the conditions of massive global disparities, rather it is someone my above mentioned taxi driver (who was not even aware of the fact that the Prada foundation is a Museum and not the seat of the eponymous luxury goods company). This entry was posted on Wednesday, December 6th, 2017 at 18.05	and is filed under culture, migration, politics, review, technology, travel. You can follow any responses to this entry through the RSS 2.0 feed. Both comments and pings are currently closed. powered by WordPress | rss feed here | meanwhile... by Paul Keller is licensed under a Creative Commons Attribution 3.0 License.